With the demise of sun worshipping as a safe experience, beach-lovers everywhere must discover alternatives to simply laying there baking in the blazing sun. Armed with a heavy sunblock and Sandtiquity, a visit to the beach can become instead a trip through a door back through time. The authors—an architect, a sculptor and a photographer—have recreated and updated this classic guide on how to build, out of sand, models of some of the greatest architectural wonders of the world. Readers may marvel at the seeming complexity of the structures revealed in a plethora of stunning photographs scattered throughout the book. Don’t be fooled, caution the authors. They hasten to assure those uninitiated in the art of sand-chitecture of the utter simplicity of the tools and techniques required to reproduce amazing structures at the beach of the builder’s choice. The only tools needed are a straight-edged, flat stick of wood, found on most beaches, eager hands, and of course, sand. For really dedicated sandtiquitists the authors suggest, along with illustration of the same, a new and improved tool birthed from their own many years of experience—a flat stick to which has been added a rib on one side, which provides even better packing ability and is a time saver to boot. As for the nitty-gritty of the art—the sand—fine, damp sand will yield the quickest and most rewarding results. While typically the sand fifteen feet from the water’s edge has some of the best packing ability, after a day of rain, almost any spot can be used to turn out architectural wonders. The techniques are equally as relatively simple: pile, pack and cut. No other trick, they encouragingly reveal for even the most timid of enthusiasts, is needed. And these easy techniques put the art well within the reach of sandtiquitists of almost any age and imagination level. With these few simple tips, Sandtiquity then jumps straight into the heart of the matter, how to recreate, often in a few minutes, miniature models of sundials, pyramids, amphitheaters, arched roofs, walled cities, forts, gateway, and monuments. Included is guidance on how to build a Sphinx: cut from the top down; a Buddha: a rolling motion of the flat stick is needed here; the Great Wall and other specific structures. There is even advice on how to cover up evidence of footprints and kneeprints around the work and how to best photograph the end results. The authors provide a few cautions as well—such as not getting too attached to the creations one builds. Invariably, sooner or later, if the surf does not take it away some rampaging youngster will—young boys especially can not seem to resist the urge to destroy a mound of sand, the authors note. But, it is a great way to make friends. Sandtiquities irresistibly draw crowds of interested spectators—many of whom will at some point want to lend a hand. Although priced a bit beyond the inexpensive, the book’s pictures alone will tease would be architects, historians and just plain young-at-hearts to want to learn the secrets of design. Young sandtiquitists can amaze their friends and older beachcombers will find it returns them to a time of youthful play—even those who have long forgotten how. 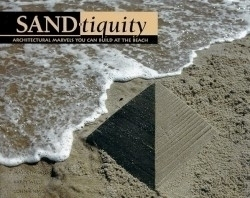 Sun and sand and surf; these three elements continually beckon scores of worshippers with their timeless call—and the art of Sandtiquity will add the delight of the dawn of creating the architectural wonders of the world for those who answer.